Throwing all caution and regard of worldwide financial stability to the winds, Pentax introduced the ALL METAL barreled FA 43/1.9 LIMITED lens in September 1997. The odd choice of focal length is said to be the exact diagonal of 35mm film....the theoretically perfect "normal" lens. Specifications: optical design of 7 element in 6 groups, 49mm filter size, weight of just under 6 oz with hood attached. Just like its name, information on the 43/1.9 is also very LIMITED. While I have found it listed at the Pentax site, that's about all. This is a very strange lens, since its barrel is ALL METAL. So far as I know, the 43/1.9 Limited is the ONLY metal chrome finished autofocus SLR normal lens made by any manufacturer. Stranger still is the "Limited" label actually being on the filter ring. I can think of no similarly labeled lens. The original purchaser of this particular lens was told in Tokyo that the 43/1.9 has Aspherical elements. Pentax does not list Aspherical design in any specs that I have been able to find. According to a Pentax insider, the Aspherical element story was just a popular rumor, not fact. By substantially improving the craftsmanship, finish, and construction materials in their AUTOFOCUS 43/1.9 lens, Pentax audaciously challenged and destroyed today's much loved modern standard of mediocre construction quality. By producing a quality made autofocus "normal" lens, just when the rank and file photographer had forgotten about and gave up on getting anything better than PLASTIC in their lens barrels, lens caps, and lens shades, Pentax destroyed the ever prevalent marketing myth that such quality construction is impossible in today's world. The danger of course, is that consumers will start demanding HIGHER quality. For years consumers were told it was impossible, but the 43/1.9 proves that was just a lie. Should consumers hold out for better quality, sales will slump, jobs will be lost, huge maga-corporations will be forced into bankruptcy. World wide unemployment and financial disaster will be the sure result. 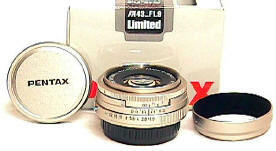 In 1999 Pentax announced a new Limited lens similarly styled to the 43/1.9, a 77/1.8 of all things. Slowly catching on to the threat to the world economy, Wall Street stock values dropped considerably in the 2000, word must be getting out. Alas, things may get worse. Pentax announced a Limited Edition 31/1.8 at Photokina, and the 43/1.9 in Leica screw mount -- the first Pentax lens in Leica Mount (I hope not the last). Originally released in chrome only, Pentax tempted fate by new issues of the 43/1.9 and 77/1.9 in black at the end of 2000. In 2000 Pentax continued its assault on the world economy with a special chrome edition LX 2000 and a new chrome manual focus 50/1.2 A lens. Rumors are that the LX may be discontinued after this special edition. As Alice learned in Wonderland, all things are not always what they seem. 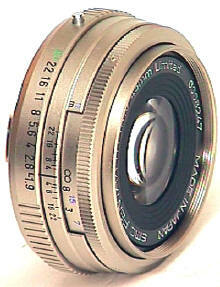 In January 2001, I reported a Tokyo rumor that the Pentax Limited series may not be made by Pentax, but by Cosina. A Pentax insider assures me me that the K mount Limited Series, both optics and lens barrels, are indeed designed, made, and produced solely by Pentax. However, that still leaves the 43/1.9 in Leica Screw mount. Apparently the design and optics are by Pentax, but the lens barrel is produced by another, yet un-named company. 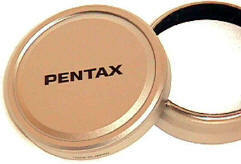 Of course any sane person will probably asks what difference does it make, so long as Pentax is on the filter ring? The answer is that it's fun for camera techno nuts to search a bit further beyond the label to see what is really going on. While Pentax lovers may grumble at the speculation that a Pentax lens might be a Cosina, without the open discussion on the internet, I would not have been able to apparently confirm that the 43/1.9 Leica Screw mount Pentax is not entirely Pentax -- so perhaps open speculation and discussion is not such a bad thing after all.